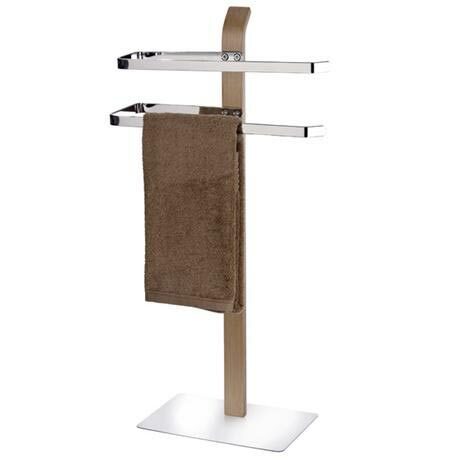 The sleek Samona standing towel stand, manufactured from a combination of high-quality plywood with shiny chrome finished metal elements, comes with two curved arms for hanging towels or clothing. The Samona towel stand stands for functionality in a stylish design, through a combination of high quality material it blends beautifully into any bathroom. The perfect solution to extra storage, the perfect solution to a stylish alternative. The freestanding towel stand offers a unique look unequal to any other and is made from a durable and robust material. The freestanding element means that you can place it anywhere around the bathroom, at your convenience. Designed to evoke the feeling of nature, it is a must have for people looking to keep up to date with bathroom trends. Ideal as a clothes rack in the bedroom. The chrome base plate provides a solid grip.